He suited his role as Sixth Form Tutor, taking a caring interest in the students’ welfare, including guiding and promoting their university applications very successfully. He took a strong lead in the all-age Science and Engineering Club, and latterly coached and organised both girls’ and boys’ hockey training sessions and match days. Stephen has proved outstandingly pleasant and easy to work with and we will miss his considerable chemical expertise and his consistent, straightforward integrity. We wish him fulfilment, success and happiness as he takes up his new position as an industrial analytical chemist. Having taught Mathematics for 13 years at Hymers, Trish has taken retirement and the chance to engage in more of her interests. Her legacy of results is testament to her skills with empowering students to achieve their targets. As tutor for 12/13 U, Trish oversaw many pupil’s lives and was involved in guiding them over university and course choices, as well as dealing with the final leap from childhood. Her caring approach was appreciated by her tutees, who also enjoyed her sense of humour. We hope that Trish can enjoy her interests in sport and travel. 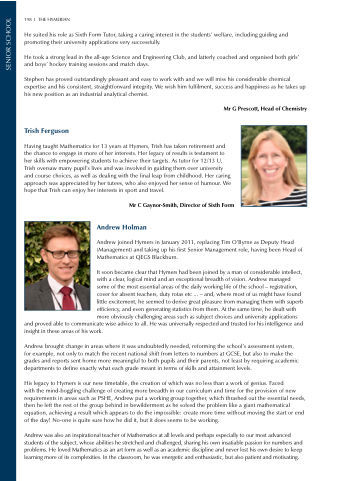 Andrew joined Hymers in January 2011, replacing Tim O’Byrne as Deputy Head (Management) and taking up his first Senior Management role, having been Head of Mathematics at QEGS Blackburn. and proved able to communicate wise advice to all. He was universally respected and trusted for his intelligence and insight in these areas of his work. Andrew brought change in areas where it was undoubtedly needed, reforming the school’s assessment system, for example, not only to match the recent national shift from letters to numbers at GCSE, but also to make the grades and reports sent home more meaningful to both pupils and their parents, not least by requiring academic departments to define exactly what each grade meant in terms of skills and attainment levels. with the mind-boggling challenge of creating more breadth in our curriculum and time for the provision of new requirements in areas such as PSHE, Andrew put a working group together, which thrashed out the essential needs, then he left the rest of the group behind in bewilderment as he solved the problem like a giant mathematical equation, achieving a result which appears to do the impossible: create more time without moving the start or end of the day! No-one is quite sure how he did it, but it does seems to be working. Andrew was also an inspirational teacher of Mathematics at all levels and perhaps especially to our most advanced students of the subject, whose abilities he stretched and challenged, sharing his own insatiable passion for numbers and problems. He loved Mathematics as an art form as well as an academic discipline and never lost his own desire to keep learning more of its complexities. In the classroom, he was energetic and enthusiastic, but also patient and motivating.